Happy Birthday, Shri Ratan Tata! The tallest feather in the Parsi cap standing today, a national treasure revered globally, Shri Ratan Tata is the ultimate exemplification of Philanthropy, Nation Building and Statesmanship. 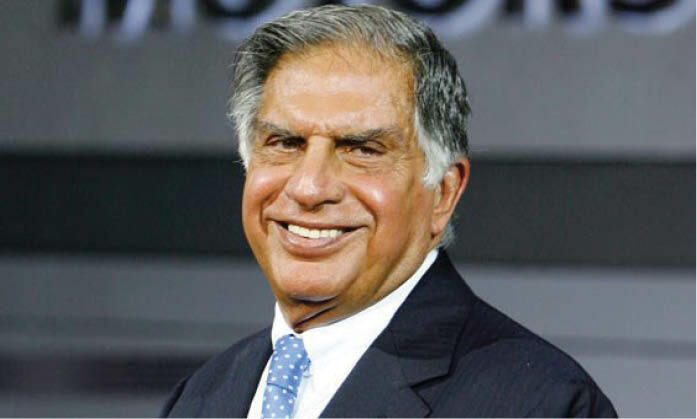 One of India’s greatest philanthropists, Ratan Tata – the unparalleled pride of the Parsi and Zoroastrian Community in India and worldwide – is known to invest over 65% of his share in Charitable Trusts. A true Indian visionary, his aim is focused on human development and nation building. Parsi Times salutes and celebrates the man who personifies Greatness, Grace and Goodness, as he approaches his Birthday on 28th December. One of India’s leading industrialists, Ratan Tata is the ex-Chairman of the largest Indian conglomerate, Tata Group of Companies, currently holding the post of Chairman Emeritus of Tata Sons, the holding company of the Tata Group which controls some of the major companies including Tata Steel, Tata Motors, Tata Power, Tata Consultancy Services, Indian Hotels and Tata Teleservices. Ratan Tata was born to Naval Tata and Soonoo Commisariat on 28 December, 1937, and was brought up by his grandmother, Navajbai Tata. He has two siblings – brother Jimmy and step-brother Noel Tata. He studied in Mumbai’s Campion School and the Cathedral and John Connon School, and in 1962, obtained his BS in Architecture with Structural Engineering from Cornell University, USA. In 1975, he completed an Advanced Management Program from the Harvard Business School – an institution which he has since endowed. He started his career shoveling stones and worked with the furnaces along with the blue-collar employees. This challenging job helped him gain a better understanding and respect for his family business. He worked as Director-in-Charge of the National Radio & Electronics Company Limited (NELCO) and later at Empress Mills, a struggling textile mill. In 1991, JRD Tata appointed him the new Chairman of the Tata Group of Companies, where he successfully enhanced the financial success of the industries and expanded the growth of the organization under his leadership. He transformed the management and vision – innovation was given priority and younger talent was infused and given responsibilities. Under his stewardship, overlapping operations in group companies were streamlined into a synergised whole, with the ‘Salt-to-Software’ group going global like never before. During his 21 year leadership of the Tata Group, revenues grew over 40 times, and profits, over 50 times! He boldly got Tata Tea to acquire Tetley, Tata Motors to acquire Jaguar Land Rover and Tata Steel to acquire Corus. All this turned Tata from a largely domestic business house into a global enterprise, with over 65% revenues coming from operations and sales in over 100 countries. Ratan Tata resigned his executive powers in the Tata group on 28 December 2012, upon turning 75. His strong belief of giving wealth back to the people is reflected in his donations accounting to approximately 60-70 per cent of his wealth, especially in support of causes related to Education, Medicine and Rural Development, distinguishing him as India’s foremost philanthropist. 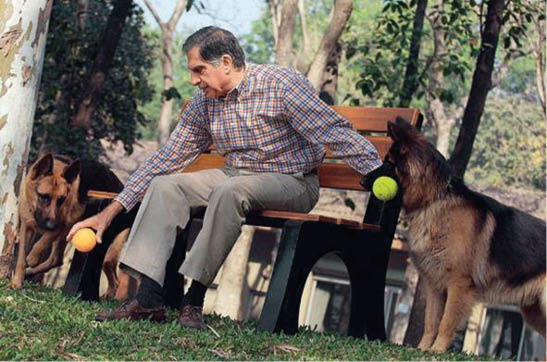 But Ratan Tata’s legendary generosity extends beyond humans! Recently, the newly renovated Tata Group’s 94-year-old heritage building – Bombay House – made headlines in national dailies, when it reopened after undergoing a dramatic renovation and restoration process for the first time in history. A spacious and special kennel was created for the canine friends of the streets who had been an integral part of the building and its history for decades. They were always allowed within the building premises, but now they have their own room! Ratan Tata has been the recipient of innumerable national and global honours. He received the prestigious Padma Bhushan in 2000 and Padma Vibhushan in 2008, the highest civilian honours awarded by the Government of India. Other notable awards include multiple global doctorates, fellowships and Leadership Awards from numerous national and global institutions and governments including Honorary Fellowship of The London School of Economics and Political Science (2007); ‘Grand Officer’ of the Order of Merit of the Italian Republic’ (2009); Honorary Knight Commander of the Order of the British Empire, United Kingdom (2009); ‘Honorary Knight Grand Cross of The Order of the British Empire’ (2014); ‘Oslo Business for Peace Award’ (2010) and Doctorates from IIT (Mumbai, Kharagpur and Chennai), and Universities including Cambridge and Yale amongst numerous others! Here’s wishing Shri Ratan Tata a very Happy Birthday – may he continue shining as the brightest light in Parsi universe! The Birth Of The “Unconquered Sun (Mithra or Meher Yazata)”?